Want to make something big and bold in nice earthy colors? 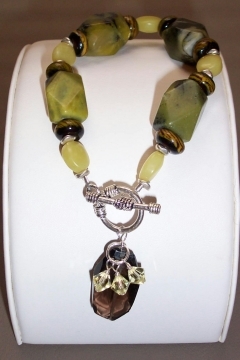 Inspired by the mossy green forests in Oregon, this beautiful yellow turquoise bracelet is rustic with it's gorgeous chunky yellow turquoise beads, set off with chartreuse oval jade beads, gold and green lampwork glass beads, and silver details. 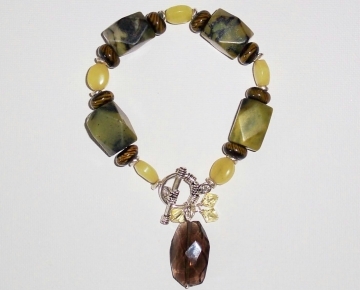 To complete the design and make this bracelet unique, it features a large dangle bead charm of smoky topaz, with three Swarovski crystal bead accents. Silver spacer beads. I used silver base metal rustic spacer beads. You can make any design that you like, which will largely depend on the beads you selected for your design. Try to alternate smaller beads with larger beads, and place silver spacer beads in-between each bead for more sparkle and interest. My design used four large nugget beads, five jade beads, and eight lampwork spacer beads. Slide a crimp bead onto the wire, feed the wire through the clasp loop, then back through the crimp bead. Pull the wire snug, and crimp the bead closed. Follow the How to Use Crimp Beads instructions if you are not familiar with this technique. Repeat on other side, making sure you pull the wire tight to beads before crimping. TIP - Because this is a toggle clasp, you will want to leave a little "play" in the wire so the clasp is easy to put on, so leave a little room where the loop of wire attaches to the clasp. Cut off remaining tails of wire with flush cutters. 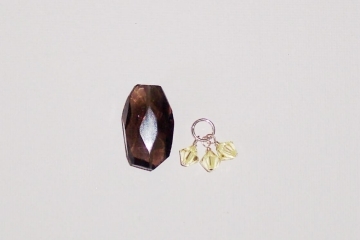 Let's, prepare the smoky quartz charm drop bead. Slide each crystal bead onto a headpin, and attach them with a closed wire loop to your soldered jumpring. 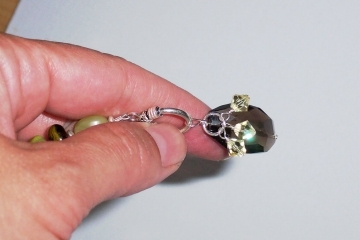 Next, slide the smoky quartz bead onto a headpin, and make a large wire loop at the top. 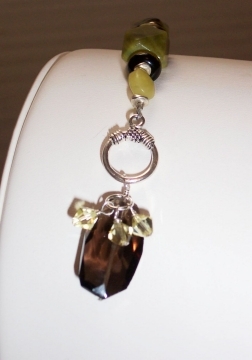 Before closing the loop, attach the jumpring with crystals, and attach the entire beaded charm to the round part of your toggle clasp so it slides freely. If you need help learning to make a loop, follow these instructions. 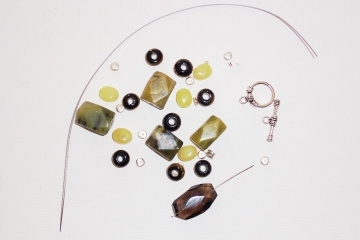 If you are using a top-drilled quartz bead, wire wrap these as you would a briolette bead. Follow my instructions for wire wrapping a briolette to make a closed loop at the top. That's it! 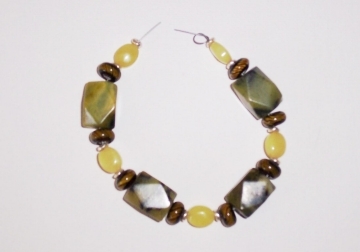 Your gorgeous new yellow turquoise bracelet is ready to wear!